I’ve been meaning to come here for so long now, and finally had an excuse to come. The space looks beautiful from outside, and is only a short walk from DongMen MRT station and the bustling YongKang Street area. I don’t mind spending money for something that looks great, but I draw the line at $200 for a cup of this matcha tea. Matcha is, for those who don’t know, finely ground green tea originating from Japan. It’s popularity has boomed thanks to Instagram, and is now a staple on most cafe menus and dessert shops around Asia. This was where it was at. By far the best dessert of the three we ordered. 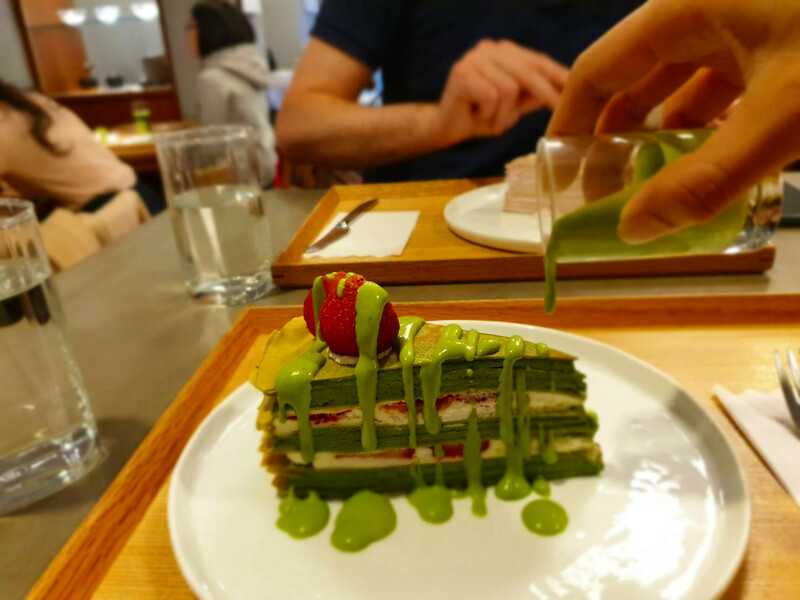 Fine layers of matcha pancake were seperated by matcha cream, strawberry’s, and more cream. It was delicate, and it was great. My only complaint? One of my strawberries was near frozen in the middle. It was served with a matcha cream/custard, which was ceremoniously poured on top for wonderful effect. The great thing about this whole dessert, is that it wasn’t particularly sweet. I feel like sometimes Matcha inspired desserts can just overload on the sugar to combat the bitterness of the tea. In my view, it doesn’t need to be like that. Fortunately, Matcha One share the same view, too. An interesting menu item which can only be ordered during the cherry blossom (Sakura) season. It was light, fragrant, and pretty damn good, actually. But, the Matcha one was so much better.